Archive: Inishowen Blog: “Meet Our Members”- Familiarisation Trip around the Peninsula. “Meet Our Members”- Familiarisation Trip around the Peninsula. With the autumn season upon us, we take a brief moment to reflect on the summer season. Tourist Offices such as Buncrana, here in Inishowen have seen a significant increase in visitor numbers during the first half of 2015. Inishowen Tourist Office has had a 34% increase in footfall in comparison to the same period in the previous year. Inishowen Tourism provides a range of services to members and visitors in the Peninsula. We have eagerly invested our human resources in meeting the needs of our members, and revised opening times this summer to be “open” for visitors in terms of promoting “things to see and do” when you visit. There have been direct benefits from investing in the current wave of activity, and building on the potential of “The Wild Atlantic Way” project. Inishowen Tourism has spent a busy summer meeting and greeting, with face to face contact in the office, and marketing promotion through online and offline channels. One of the key goals set for the summer was to meet with our members, and get real insight into both their individual tourism businesses, location, and surrounding area (points of interest, cultural or historical context). This would allow our staff to inform prospective visitors on “what is on offer” here in Inishowen with greater clarity and enthusiasm, with real experience of it. Having a wide variety of members that specialise in attractions, activities, accommodation and food, we decided to divide the Peninsula into areas to be covered within day trips, this would include the highlights of the particular area. All members on the day trips informally provided key information from their perspective, and kindly invited us into their home or business to learn more. 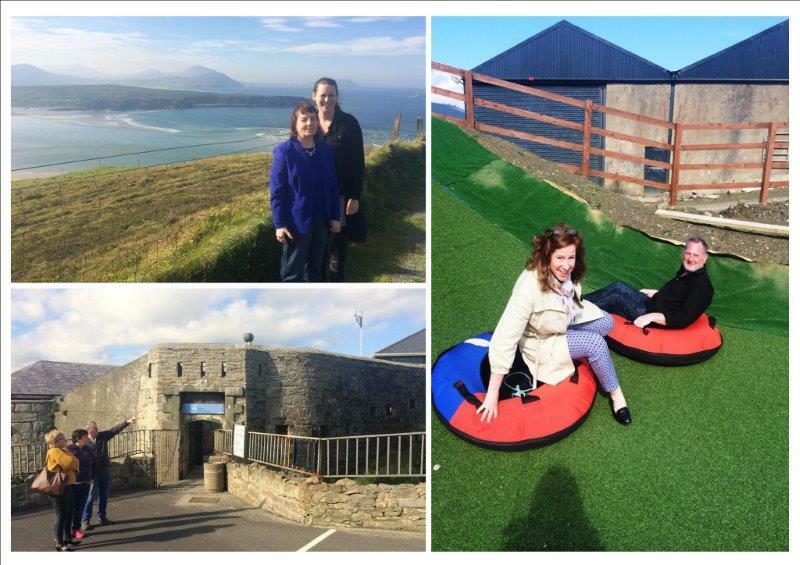 The learning experience gained during these trips for the staff at Inishowen Tourism was reflected in the visitor feedback both online and offline, on Trip Advisor reviews and emails received. Visitors also made a second visit to the office to say how much they had enjoyed their experiences, feedback that was much appreciated. We rely on our visitors and members to provide feedback to improve services and make recommendations for future development. Highlights of our visits with particular information to enhance the visitor experience were documented, and Inishowen Tourism were grateful for the opportunity to meet the members and would like to thank the members for their warm welcome, sharing some experiences over a tea and scone, or sliding down the slopes at Inishowen Quad Safari.